AC electric motors and generators are the most common machines found in industries worldwide. With its vast experience and extensive data bank from all major electric motor OEM’s, Motion Electric Motor Services is a key partner to maintain and protect the productivity of the critical equipment at the heart of your activities. Trust our expertise when it comes to AC electric motor repair! Salient pole rotors and generators are typically used either in lower speed electrical applications such as hydro power plants or high speed applications such as refiners and compressors. The rotors of such machines will have between 4 and 60 field poles. Over the years, Motion Electric Motor Services has developed a unique approach to the refurbishment of such machines. DC electric motors and generators have fueled industrial production worldwide for many years now. With its vast experience and extensive data bank from all major electric motor OEM’s, Motion Electric Motor Services is a key partner to maintain and protect the productivity of the critical equipment at the heart of your activities. Trust our expertise when it comes to DC electric motors and generators repair! Motion Electric Motor Services takes the expertise it has developed in the shop and brings it to the field. Our mobile teams of experiencedt technical staff conduct maintenance work either independently or in collaboration with your own teams. Trust Motion Electric Motor Services to improve the reliability of your electromechanical units! 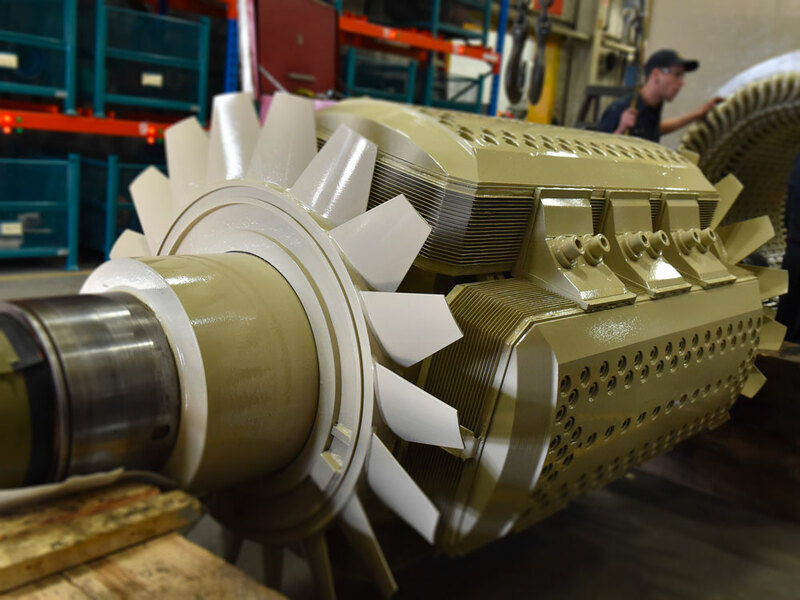 Because a production plant is a complicated environment with many different units, Motion Electric Motor Services provides maintenance, repair and reliability services on a breadth of rotating equipment. Our dedicated experts are continuously training to display the best practices in their respective specialties. We pledge to “repair once and for all”. We always perform a root cause of failure analysis and ensure that our repair specifications take our findings into account. Our experts also share their expertise and experience with local maintenance team to improve environmental constraints that can impact the lifespan of their equipment. We are your expert working to protect your productivity! VPI stands for Vacuum Pressure Impregnation. It is a process by which a fully wound rotor or stator is completely submerged in a resin. Through a combination of dry and wet vacuum and pressure cycles, the resin is assimilated throughout the insulation system. A VPI insulation system provides an optimal shield for the winding in harsh environments while also improving the mechanical stiffness of the rotating machine.